Post: Gaurav Akrani. Date: 12/02/2010. No Comments. Label: Economics, India. The balance of payments of a country is a systematic record of all transactions between the residents of a country and the rest of the world carried out in a specific period of time. 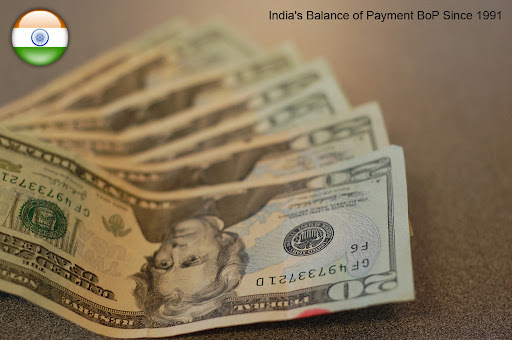 India's balance of payment worsened in the early 1990's but now the situation is under control. In fact, India has a good foreign exchange reserves mainly due to capital inflows from foreign financial institutions or the stock exchange. Table below indicates India's BoP position in between 1990-91 to 2005-06. 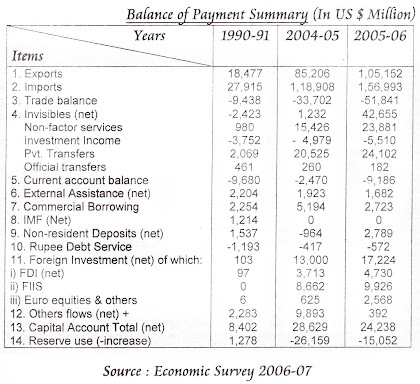 Trade balance was in deficit through out the period shown in the table as imports always exceeded the exports. Within the imports the POL items constituting a sizeable position continued to increase throughout. Exports did not achieve the required growth rate. 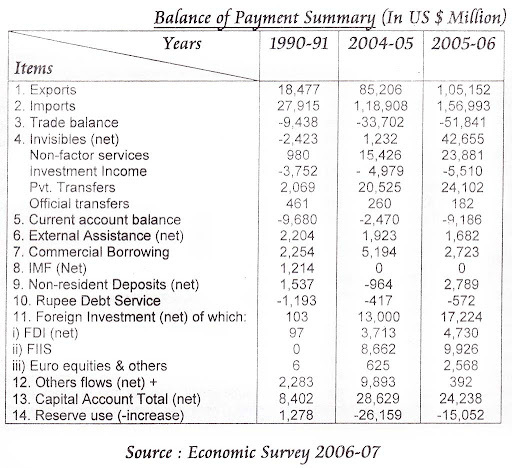 Trade deficit in 2005-06 stood at $ -51,841 billion US $. Current account balance includes visible items (trade balance) and invisibles is in a more encouraging position. It declined to $ -2,666 million in 2000-01 from $-9680 million in 1990-91 and recorded a surplus in 2003-04 to the extent of $ 14,083 million. In 2005-06, once again there was a deficit of $ 9,186 million. The main reason for the improvement during 2001-05 was the success of invisible items. The impressive role placed by invisibles in covering trade deficit is due to sharp rise invisible receipts. The main contributing factor to rise in invisible receipts are non factor receipts and private transfers. As far as non factor services receipts are concerned the main development has been the rapid increase in the exports of software services. As far as private transfers are concerned their main constituent is workers remittance from abroad. During this period the private transfer receipts also increased from $ 2,069 million in 1990-91 to $ 24,102 million in 2005-06. The current trend of outsourcing a number of jobs by the developed countries to the developing ones is also helping us to get more jobs and earn additional foreign exchange. Capital account has been positive throughout the period. NRI deposits and foreign investment both portfolio and direct have helped to a great extent. The main reasons for huge increase in capital account is due to large capital inflows on account of Foreign direct investment (FDI); Foreign Institutional Investors (FIIs) investment on the stock markets and also by way of Euro equities raised by Indian firms. The Non-resident deposit also form a part of capital account. Reserves have changed during this period depending on a balance between current and capital account. An increase in inflow under capital account has helped us to build up our foreign exchange reserve making the country quiet comfortable on this count. In April 2007 we had $ 203 billion foreign exchange reserves. The year 2005-06 registered the highest trade deficit so far running into $ 51,841 million, because of rising Oil prices; As a result despite impressive positive earnings of as much as $ 42,655 million from invisibles, the current account deficit in this year was $ 9,189 million which is 1.1% of GDP. The balance of payment situation started improving since 1992-93. There was a satisfactory balance of payment position in that period; the reasons are (i) High earnings from invisibles, (ii) Rise in external commercial borrowings, and (iii) Encouragement to foreign direct investment. The positive earnings from invisibles covered a substantial part of trade deficit and current account deficit reduced significantly. The external commercial borrowings was extensively used to finance the current account deficit. The net non resident deposits were positive through out the ten year period. There has been a growing strength in India's balance of payment position in the post reform period inspite of growing trade deficit and current account deficit.